Loving Rice: Sorry Starbucks! Wow Wawee! We found a new neighborhood hot spot (no pun intended!). Wawee Coffee (pronounced wah-wee) is such a welcoming oasis in the middle of busy Bangkok that we might very well have to say good-bye to our frequent Starbucks' stops. With a fairly large garden tucked behind the busy streets, Wawee has created a series of decks and bridges that seemingly float over Koi ponds and weave through lush tropical foliage. The ever-present incense floats through the air and hidden benches, a gazebo and market umbrellas are tucked throughout the setting to provide respite from the heat. Inside, chandeliers hang in cozy elegant rooms where patrons enjoy creamy, whipped cream topped creations and one of Bangkok's many ever present dessert cases continues to be refilled regularly. T and I enjoyed a morning out on Saturday and discovered the joy of Wawee's relaxed atmosphere. Today, I shared it with the kids. On our walk to the shop, we wove our way through a series of sky bridges (used to access the Skytrain or to cross major streets that you wouldn't dare cross at ground level) and side streets and alleys. In Bangkok, you do anything you can to avoid the traffic! And, during our walk we enjoyed the sites that have become 'normal'... the crazy motorcycle taxis where women sit side saddle, while wearing high heels!, the lines of food carts selling everything from BBQ meats to steaming bowls of ramen to beautifully sliced fresh fruit, and the golden wats perched in corners and adorned with incense, flowers and assorted tiny offerings. I snapped the picture at the left as we walked to Wawee Coffee this morning. The image provides a glimpse of a well established neighborhood walkway. This is a rare alleyway in which traffic is blocked from entering allowing the perfect location for a few stores, a fresh market on some days and a collection of spontaneously created restaurants every day starting at lunch time (created from the tables leaning against the wall). There is a wat in the background and, just through the gate, you can see a motorcycle taxi. Upon arrival at our destination, F ordered what has become his regular drink here (100 per cent kiwi juice, with ice, thank you very much!). C didn't let the morning's climbing Celsius slow her down and ordered a steaming cocoa. She was thrilled with Wawee's buffet of sugar straws that accompanied her creamy concoction, no doubt. And, I ordered an iced tea with milk (known simply as 'Thai Iced Tea' in the States) and it was yummy. I asked how they made their version because it was markedly less sweet and less thick than the ones I've had before. When eating at Thai restaurants prior to arriving in Thailand, I had occasionally ordered a Thai Iced Tea and had always, no matter where I was, considered it a delicious treat. Funny how something authentic provides you with a new level of deliciousness! Wawee's authentic version consists of a simple ratio consisting of less sweetened condensed milk than other recipes that I've previously followed. 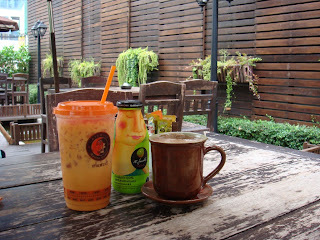 We left Wawee Coffee with a relaxed vibe that carried us throughout the rest of our morning's outings. And, we're already looking forward to our next visit. Burn a little incense, crank the heat up high, kick your feet up, throw in some noisy engine sounds masked by water features, don't move too quickly and you'll (almost) feel like you're in Bangkok with us. Pour boiling water over the tea bags and allow to steep for five minutes. Remove tea bags and place in refrigerator until cool (or use three tea bags and add a bit of ice to cool more rapidly). Once cool, fill a tall glass with crushed ice, pour tea to 3/4 of the glass and add the sweetened condensed milk (a little extra if you like it sweeter) and regular milk. You want to achieve about 1/4 of your cup full of the milk combination. It should be sweet, but just slightly, and the tea should provide a nice nutty, fragrant background to the sweetened milk. Stir well and serve with a straw. Sip slowly and enjoy. *Can be found in the Asian foods section of most gourmet grocery stores or import stores. If you are unable to find Thai tea, look for an unflavored black tea instead. **Use your choice of milk. Whole will create a creamier drink than non-fat, but both will create an enjoyable iced drink.